"This is what we have to confront. These are the people our political figures consult with: military officers, judges and lawyers, business people, Catholic Church hierarchy. And they supported the coup. They say they have all the right “gente” supporting them. 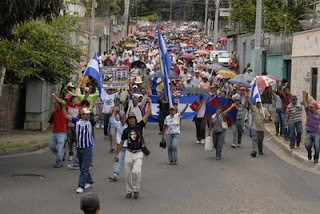 We have the “pueblo” supporting the return of Zelaya." I've personally given up on calling the State department. They are basically supporting the Honduran coup. In speeches Hilary Clinton equates the attackers with the attacked. She blames Zelaya. The US has not frozen assets, cut off trade, or even stopped all aid! I am disgusted. But I continue to have great faith in el pueblo. My good friend Andres is reporting from inside the Brazilian embassy. Please hold him, and all of the Hondurans in struggle, in your hearts. Let us be in the struggle together.